This is the pseudonym of Georges Sim, who writes about himself as follows: "Born in Liège, Belgium (1903). At 16 years of age, reporter on the Liège Gazette. At 17, published my first novel, Aboard the Ark. At 20, marriage; moved to Paris. From 20 to 30, published about 200 popular novels under 16 pseudonyms, and traveled, chiefly in a small boat, all over Europe. 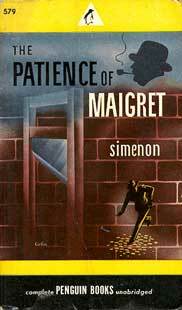 At 30... wrote his first detective novels and created the character of 'Inspector Maigret'. For 2 years, wrote a novel of this series every month. At 33 abandoned mystery novels, and was at last able to write more personal works. That's all." Far from being all, this terse sketch fails to indicate the enormous following Simenon has built for himself in 17 languages. André Gide nominated him as "perhaps the greatest and most truly 'novelistic' novelist in French literature today." Deems Taylor said, "to my mind, Maigret is the greatest character in detective fiction since Sherlock Holmes." Many other people, usually allergic to detective stories, have been entranced by him.